With spring right around the corner, most families look for opportunities to experience the outdoors and enjoy the warmer weather with their children. 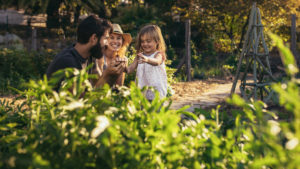 The list of possible outdoor activities that are fun for you and your child is endless, but one that has proven to be beneficial to a child’s development and growth is gardening. Children are naturally curious. They like to learn by engaging in activity and they love to play in the dirt. For a child, working in a garden can grant him the satisfaction of caring for something over time, while exploring the workings of nature. 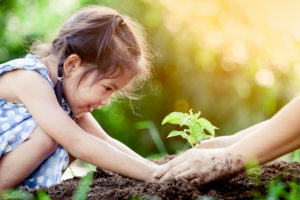 Whether you are simply planting seeds in a flower pot, caring for a terrarium, or tending to a large outdoor garden, spending time caring for a garden with your child has many benefits. Gardening engages all of the senses. Have your child squish her hands in the dirt and describe the way it feels. Encourage her to add some water and ask her how it looks different than before. Ask her what the flowers smell like and then have them take a bite of the ripened fruits or vegetables and describe the way it tastes. Gardening encourages healthy eating. It’s natural for most children at a young age to be picky eaters, especially when it comes to eating their vegetables. Growing a vegetable from a seed creates a sense of pride for everyone. Your child will be so excited about growing his own food, he may be curious enough to gives those home-grown veggies a taste. This, in turn, inspires him to keep growing his own food and incorporate the healthy eating habits he has learned. Gardening introduces children to scientific concepts. A child’s sense of wonder and curiosity is infinite and they are always asking questions about how the world works. What makes the leaves green? What nutrients do plants need to thrive? What type of soil is needed for vegetables to grow? Explore scientific concepts while gardening and prove to her she can learn, while also having fun. The outdoor world is an open book to your child and these are just some of the many benefits that cultivating a garden can provide. It is also time well spent as you bond and learn together, while connecting with nature!